The Lambda XL is the latest addition to Sutter’s optical product family. It is a highly stable, broad spectrum light source (±1% fluctuations). The output at the end of the light guide is same as that of Sutter’s well-recognized 300 W Lambda LS xenon arc light source. The lamp module is designed to last for over 10,000 hours and maintain no less than 50% of the original intensity at 10,000 hours. The compact, stand-alone cabinet design consists of the lamp housing, bulb, optics, and power supply in a single enclosure. The new design includes a filter wheel and SmartShutter™ driver, making it a versatile option for fluorescence imaging applications. The Sutter filter wheel with SmartShutter or the stand-alone SmartShutter can be housed within the body of the Lambda XL. The light intensity can be modified to various levels of attenuation. When the optional filter wheel is utilized, each filter position can be linked with its own, programmable, attenuation level, selected every time the filter is called. 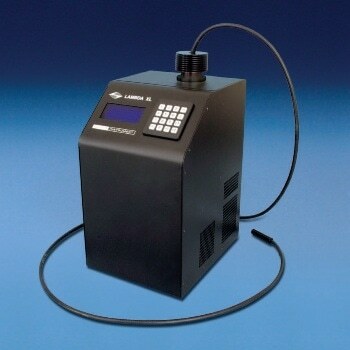 The connection to the microscope is made through a liquid light guide, which ensures output uniformity in the field of view. There are two light guide options - one optimized for the visible-near IR regions and the other for the near UV-visible regions. Mounting adapters for Olympus, Nikon, Zeiss, and Leica microscopes are available. The LB-XL package comes with the Lambda XL light source, power cord, and a manual.